UConn has contracted with 3Play Media for captioning services. Identify your department's primary account administrator. 3Play Media calls this administrator a "Super User". Super Users have access to all account information, including billing and purchase order (PO) details. 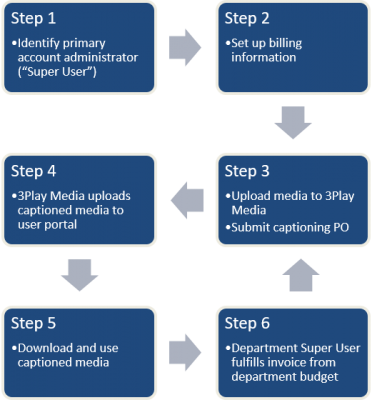 Determine billing information for your 3Play Media account. This includes your billing address and KFS number. Upload media to 3Play Media and submit your first captioning PO. Read through the different options for turnaround time; standard turnaround is three business days. 3Play Media will caption your media and upload the finished product to your account portal. You can download and use your captioned media. The Super User fulfills the monthly invoice, drawing from the departmental budget. Repeat steps 3 through 6 to submit additional captioning requests. Accounts are requested through submission of 3Play Media's form. 3Play Media will call you, typically within one business day, to set up your account. It expedites the process to already have your Super User and billing information identified. 3Play Media supports a wide variety of file formats, but it does not support all file formats. Please review this list of accepted file formats as you consider working on projects. If you are requesting captions for a GoToMeeting recording, please read this article on how to convert your recording. If you are requesting captions for a WebEx recording, please read this article on how to convert your recording. This Popular Science article offers tips and tools for converting nearly any type of file to another format. If you create your media in a program that the University does not support, the University will be unable to offer assistance in file conversion. Please review this list of supported programs before beginning your project. Learn how to set up transcription settings in this guide. There are several methods for uploading media. View these threads on uploading videos. Not sure where to start? 3Play Media has a support page broken down into categories. Want to learn more? Check out 3Play Media's Quick Start video! For a fully keyboard-accessible alternative to this video, view it in Chrome or on any Android or iOS device. You can also view it in Firefox with the YouTube ALL HTML5 add-on installed, or disable Flash in Internet Explorer.